Surrounding Kyoto Imperial Palace, Omiya Imperial Palace and Sento Imperial Palace, Kyoto Gyoen is the park which is 1.3km long north to south, 0.7km long east to west, has 65 hectares, is open to public as a National Park. In Edo period, there were more than 140 residents of imperial families and court nobles. 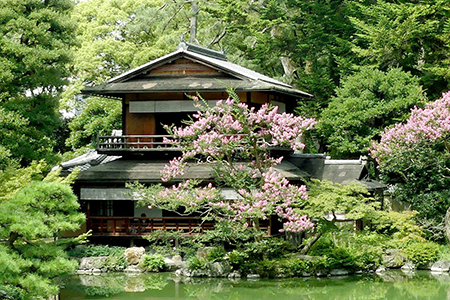 Since Meiji ear, Kyoto Gyoen has been established and maintained as a park as it is today. 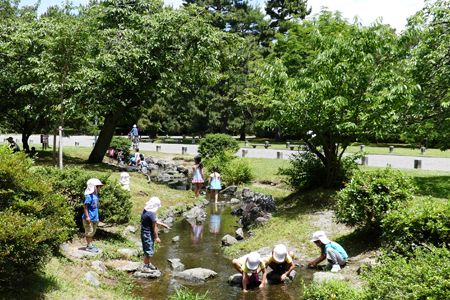 Having histrical sites and traditional gardens as well as fully natured park for walking, relaxing, and with the sports grounds at various sites in the park, there are a lot of ways to enjoy this park, Kyoto Gyoen has been the centeral park for Kyoto residents. 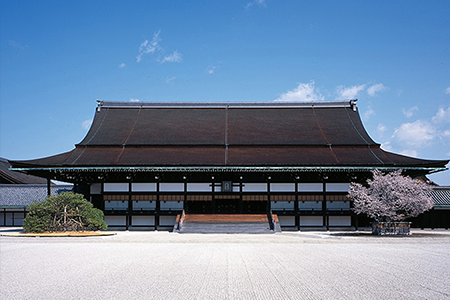 Rich in tradition, Kyoto Imperial Palace preserves the look and ambiance of the Palace as it had been in the time of Japan’s ancient imperial dynasties. The current Palace was rebuilt in 1855 and comprises several structures–including the Shisinden, the Seiryoden, the Kogosyo, the Ogakumonjyo, and the Otsunegoten–that reflect the architectural styles of various periods. Mondays (If a national holiday falls on a Monday, the Palace is open on the holiday and closed the next day, Tuesday). Year-end, and new year holidays (Dec.28 -Jan.4). 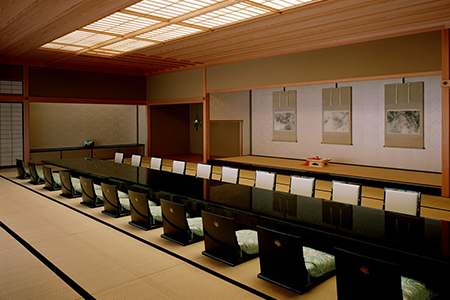 Established in April 2005, Kyoto State Guest House is the national facility to welcome foreign dignitaries and offer them experiences to deepen cultural understandings and friendships. Considering historical sight around and nature environment, designed elegantly Japanese with a style of Japanese architecture called “Irimoya” (hipped roof) and “Sukiya-zukuri”(the style of a Japanese tea ceremony building). Japanese master craftmanships such as Sukiya carpenters, plasterer, gardening, metallic foil cutting, Nishijin silk fabrics, gold lacquer, lacquerware) are fully used for the parts/skills of the building and decoraions. The Tea house that is said to be built in later Edo era. Being in use as a house until Edo period, the site of Kan’innomiya Family residence, is now open to public as an exhibition where people can learn more about nature and history of Kyoto Gyoen. In the yard, there are the pond and sandy beach reconstructed based on remains from the middle of 18th century. 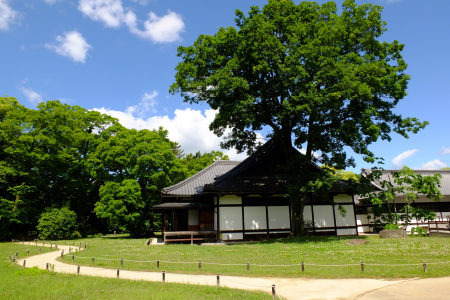 “Special Tour” PR staff will offer a special tour for nature, history and cultures related to Kyoto Gyoen twice a month. 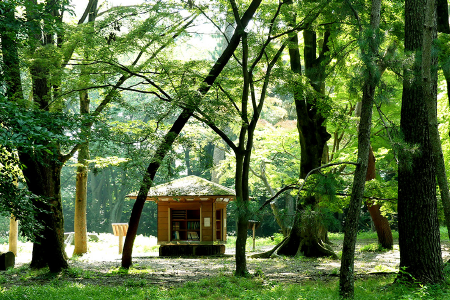 With the concept of satoyama, forests developed in the suburb of Kyoto, it is the place people can enjoy themselves being in the nature by reading book at Forest Library ( opens April 1st – November 30th) and watching birds bathing. 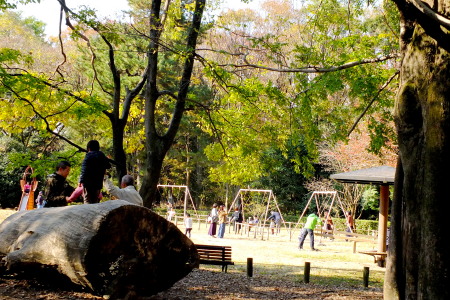 Located at the site of Konoe residence in the north west corner of the park, children’s park has swings and slides for kids to play with and resthouse for people to have a break during strolling in the Kyoto Gyoen park. About 100m long stream where kids can play in the water.